What a fantastic cruise! We chose this cruise initially for the port intensive itinerary and ended up loving both the ports and this little old ship. We spent a couple days in Amsterdam before embarking and the cruise port was very easy to get to via public transport. The departure lounge was somewhat chaotic, but we were eventually pointed to the correct location for priority check-in. We had seen the less than stellar reviews for this ship and booked it anyway, hoping for the best. It turns out that the ship is totally fine! Yeah, it&apos;s a bit older than other ships and somewhat smaller (I&apos;m told! My girlfriend&apos;s last cruise was on Freedom of the Seas but Vision is actually the largest cruise ship I&apos;ve ever been on! ), but it&apos;s got a great crew and staff and we thoroughly enjoyed ourselves. The 12-night Baltic itinerary has (A LOT) of at sea days (five!) and all those at sea days were jam packed with scheduled activities--trivias, bingos, game shows, dancing, theme parties, you name it. 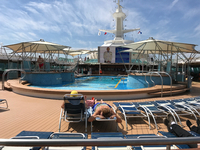 And if you didn&apos;t want to participate in any of that stuff, the Viking Crown Lounge is super chill during the day and once dinner time comes around, the Solarium empties out and you can have a nice quiet soak in the hot tub or just relax. 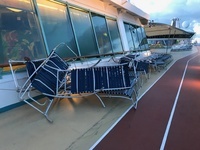 Our weather was mostly cold and windy and the upper decks were almost always deserted. Sunset wasn&apos;t until after 10pm most nights, so it was nice to get out for a late shuffleboard or an after dinner walk. Ping pong gets packed up at 9pm, though, so that was annoying! We had a "Panorama View" or "Preferred View" or...some kind of amazing view cabin on deck 8 that ended up being in the perfect location. The room was spacious and our giant windows gave us an excellent view of the people next to us in their balcony room throwing food at the seagulls in every port! Food and dining was good to just ok. One day some tiny spring rolls showed up in the Wind Jammer and they were amazing! Never saw them again, though. :( We were hoping for sushi in the Wind Jammer at some point, but we never saw it. We ate in the MDR most nights and had made reservations prior to sailing for My Time Dining. For this 12-night cruise, there were two formal nights (day 2 and day 9) and the 10 drink punch card showed up in the bars (but was never advertised in the Cruise Compass) on day 8 for $85. Park Cafe was great for late night pavlovas and we did not try any specialty restaurants. Entertainment wise, this cruise was pretty good. The nightly Centrum activities were fun; the VISION OF THE SEAS SINGERS AND DANCERS were great; the Quest thing was entertaining; and the morning show on the TV was mostly enjoyable and not annoying. The, um, headliner entertainment was...interesting. I felt like I was in a time warp to 1950s Poconos or something, what with the ventriloquists and the mime. Yes, mime. I just...I don&apos;t even know what else to say. There was legit a mime. The biggest draw for this cruise is the ports: Amsterdam, Helsinki, St. Petersburg, Tallinn, Stockholm, Aarhus, and Copenhagen. Amsterdam: we spent two days in Amsterdam before the cruise. The FreeDAM Walking Tour gave us a good overview of the city and the iAmsterdam card included public transport and entrance to a bunch of museums. Helsinki: we had a very short amount of time in Helsinki so we decided to use our St. Petersburg tour operator, TJ Travel, to schedule a Helsinki tour. The tour was ok. We&apos;d read prior that Helsinki didn&apos;t really have a lot to see and do for such a short stop and I&apos;d have to agree with that assessment. Most enjoyable was the small market at the Esplanade Park and the public art at the cathedral. Our tour guide also pointed out a spot where Finnish people go to clean their rugs and when we arrived at the Sibelius monument, she said, "I don&apos;t know what you were expecting, but this is what you get." This is now my new life motto, so thank you, lovely Helsinki! St. Petersburg: the big fish of these Baltic ports, for sure. We booked a two-day tour with TJ Travel and would recommend TJ a million times ue to their great price (much less than the ship excursion) and small group size—ours was only 13 in a nice little van. We visited the Hermitage on a Monday while it was closed to the public and walked through empty rooms; we went in through the back door at Catherine&apos;s Palace and waited approximately two minutes for entry instead of three hours out front; and et cetera. The guide was super knowledgeable and literally walked us to the front of everything. 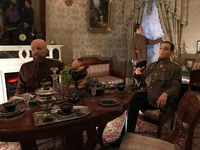 By the end of the second day I was tired of hearing about the amount of gold used to decorate the homes of imperial Russians, but that is not the fault of TJ, but rather my own trip planning failings. So, if imperial Russia is not your thing, the "standard" tour of almost all the tour operators will not be your thing. Our evening tour with TJ was meant to be a "Russian experience" and vodka tasting with a small group of six, but it ended up being just us with a guide and a driver and we had a blast on our unexpected private tour. The horseradish vodka is no joke! A last note about St. Petersburg--the ship folks make a big effort to tell you that official RC shore excursions receive priority clearance through customs. I&apos;m not sure if this is to scare people into buying their pricier tours or to just generally be confusing while maintaining some semblance of crowd control (the nice part of me wants to think the latter! ), but it&apos;s complete bunk. The Russian customs people don&apos;t care one bit who you are touring with and we somehow ended up being the first people through customs. That was super! What was not super was that after clearing customs in three minutes, we had to wait on the other side of customs for over an hour while the rest of our group came through. Tallinn: Next to St. Petersburg, Tallinn was hands down our favorite port. The town is picturesque and the port is a very short walk from Old Town. We did a free walking tour with Tallinn Free Tours and it was one of the best walking tours we&apos;ve had in any location, ever. We had a nice, cheap lunch from a bakery and went into the tunnels at Kiek in the Kok before heading back to the ship. A++ town, 11 out of 10, would visit again. 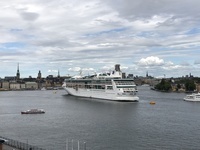 Stockholm: We opted for another local tour with TJ Travel in Stockholm so that we could get to the Vasa Museum and back around to Stockholm&apos;s other sights. The Vasa was...a museum! I mean, I guess I&apos;m glad we went there, but if we hadn&apos;t gone there, I can&apos;t imagine that I would have cared much at all. The story of the Vasa itself is fascinating, but I already knew the story before we got there because I’d read that everyone goes to Vasa and wondered "What the heck is a Vasa?" Walking through the old town was fun, we got another good, cheap lunch at a bakery and one of our favorite souvenirs at the second hand shop near the Nobel Museum. At the Nobel Museum cafe, all the chairs are signed by past Nobel Prize winners, so we had a bit of fun looking under the chairs and trying to find our favorite economists. This was also our only tender port, but our boat was parked literally feet from old town, so while the tendering process itself was a bit of a mess, the boat was in an extremely convenient location at the end of the day. Aarhus: We aren&apos;t sure why we went to Aarhus, but the Danish queen was visiting that day, so we saw the royal yacht. The town is small and very walkable and on the Saturday we were there, there were many street markets and weddings. The Danish Resistance Museum was fascinating and definitely worth a stop if you are at all interested in WWII resistance movements. Most of the written information in the museum is in Danish (obviously), but about half or a little less is translated in English. Even still, the visuals are striking. Aarhus also has a ton of street art and if you have time, the little street called Møllestien is adorable. 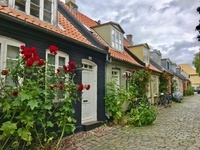 Copenhagen: The Little Mermaid statue is a fairly short walk from Langelinie pier and downtown Copenhagen is probably another 20 minutes from there. I&apos;d read that there is a bus that runs from that pier to Town Hall Square, but I never saw such a bus. We did the Grand Tour with Copenhagen Free Walking Tours and had a very nice walk and a hot dog snack (on our own, not with the tour). That about covers the tours--we didn&apos;t use the ship excursions for any port and used TJ Travel for all the organized tours we arranged. TJ was very easy to work with and offers excellent prices and discounts for combining tours. That said, if we did this cruise again, we would only use TJ for St. Petersburg and go it alone in all the other ports. All in all, this was a great, great cruise and we would definitely do it again! Amazing ports, great small ship! What a fantastic cruise! We chose this cruise initially for the port intensive itinerary and ended up loving both the ports and this little old ship. We spent a couple days in Amsterdam before embarking and the cruise port was very easy to get to via public transport. The departure lounge was somewhat chaotic, but we were eventually pointed to the correct location for priority check-in. We had seen the less than stellar reviews for this ship and booked it anyway, hoping for the best. It turns out that the ship is totally fine! Yeah, it&apos;s a bit older than other ships and somewhat smaller (I&apos;m told! 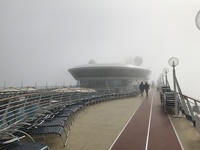 My girlfriend&apos;s last cruise was on Freedom of the Seas but Vision is actually the largest cruise ship I&apos;ve ever been on! ), but it&apos;s got a great crew and staff and we thoroughly enjoyed ourselves. The 12-night Baltic itinerary has (A LOT) of at sea days (five!) and all those at sea days were jam packed with scheduled activities--trivias, bingos, game shows, dancing, theme parties, you name it. 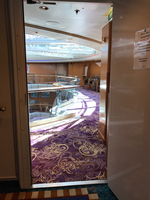 And if you didn&apos;t want to participate in any of that stuff, the Viking Crown Lounge is super chill during the day and once dinner time comes around, the Solarium empties out and you can have a nice quiet soak in the hot tub or just relax. Our weather was mostly cold and windy and the upper decks were almost always deserted. Sunset wasn&apos;t until after 10pm most nights, so it was nice to get out for a late shuffleboard or an after dinner walk. Ping pong gets packed up at 9pm, though, so that was annoying! 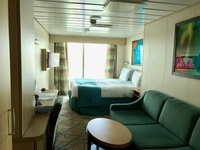 We had a "Panorama View" or "Preferred View" or...some kind of amazing view cabin on deck 8 that ended up being in the perfect location. The room was spacious and our giant windows gave us an excellent view of the people next to us in their balcony room throwing food at the seagulls in every port! Food and dining was good to just ok. One day some tiny spring rolls showed up in the Wind Jammer and they were amazing! Never saw them again, though. :( We were hoping for sushi in the Wind Jammer at some point, but we never saw it. We ate in the MDR most nights and had made reservations prior to sailing for My Time Dining. For this 12-night cruise, there were two formal nights (day 2 and day 9) and the 10 drink punch card showed up in the bars (but was never advertised in the Cruise Compass) on day 8 for $85. Park Cafe was great for late night pavlovas and we did not try any specialty restaurants. Entertainment wise, this cruise was pretty good. The nightly Centrum activities were fun; the VISION OF THE SEAS SINGERS AND DANCERS were great; the Quest thing was entertaining; and the morning show on the TV was mostly enjoyable and not annoying. The, um, headliner entertainment was...interesting. I felt like I was in a time warp to 1950s Poconos or something, what with the ventriloquists and the mime. Yes, mime. I just...I don&apos;t even know what else to say. There was legit a mime. The biggest draw for this cruise is the ports: Amsterdam, Helsinki, St. Petersburg, Tallinn, Stockholm, Aarhus, and Copenhagen. Amsterdam: we spent two days in Amsterdam before the cruise. The FreeDAM Walking Tour gave us a good overview of the city and the iAmsterdam card included public transport and entrance to a bunch of museums. Helsinki: we had a very short amount of time in Helsinki so we decided to use our St. Petersburg tour operator, TJ Travel, to schedule a Helsinki tour. The tour was ok. We&apos;d read prior that Helsinki didn&apos;t really have a lot to see and do for such a short stop and I&apos;d have to agree with that assessment. Most enjoyable was the small market at the Esplanade Park and the public art at the cathedral. 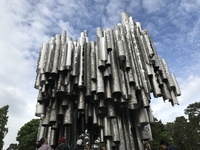 Our tour guide also pointed out a spot where Finnish people go to clean their rugs and when we arrived at the Sibelius monument, she said, "I don&apos;t know what you were expecting, but this is what you get." This is now my new life motto, so thank you, lovely Helsinki! St. Petersburg: the big fish of these Baltic ports, for sure. We booked a two-day tour with TJ Travel and would recommend TJ a million times ue to their great price (much less than the ship excursion) and small group size—ours was only 13 in a nice little van. We visited the Hermitage on a Monday while it was closed to the public and walked through empty rooms; we went in through the back door at Catherine&apos;s Palace and waited approximately two minutes for entry instead of three hours out front; and et cetera. The guide was super knowledgeable and literally walked us to the front of everything. By the end of the second day I was tired of hearing about the amount of gold used to decorate the homes of imperial Russians, but that is not the fault of TJ, but rather my own trip planning failings. So, if imperial Russia is not your thing, the "standard" tour of almost all the tour operators will not be your thing. Our evening tour with TJ was meant to be a "Russian experience" and vodka tasting with a small group of six, but it ended up being just us with a guide and a driver and we had a blast on our unexpected private tour. The horseradish vodka is no joke! A last note about St. Petersburg--the ship folks make a big effort to tell you that official RC shore excursions receive priority clearance through customs. I&apos;m not sure if this is to scare people into buying their pricier tours or to just generally be confusing while maintaining some semblance of crowd control (the nice part of me wants to think the latter! ), but it&apos;s complete bunk. The Russian customs people don&apos;t care one bit who you are touring with and we somehow ended up being the first people through customs. That was super! What was not super was that after clearing customs in three minutes, we had to wait on the other side of customs for over an hour while the rest of our group came through. Tallinn: Next to St. Petersburg, Tallinn was hands down our favorite port. The town is picturesque and the port is a very short walk from Old Town. We did a free walking tour with Tallinn Free Tours and it was one of the best walking tours we&apos;ve had in any location, ever. We had a nice, cheap lunch from a bakery and went into the tunnels at Kiek in the Kok before heading back to the ship. A++ town, 11 out of 10, would visit again. 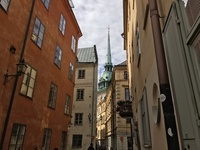 Stockholm: We opted for another local tour with TJ Travel in Stockholm so that we could get to the Vasa Museum and back around to Stockholm&apos;s other sights. The Vasa was...a museum! I mean, I guess I&apos;m glad we went there, but if we hadn&apos;t gone there, I can&apos;t imagine that I would have cared much at all. The story of the Vasa itself is fascinating, but I already knew the story before we got there because I’d read that everyone goes to Vasa and wondered "What the heck is a Vasa?" Walking through the old town was fun, we got another good, cheap lunch at a bakery and one of our favorite souvenirs at the second hand shop near the Nobel Museum. At the Nobel Museum cafe, all the chairs are signed by past Nobel Prize winners, so we had a bit of fun looking under the chairs and trying to find our favorite economists. This was also our only tender port, but our boat was parked literally feet from old town, so while the tendering process itself was a bit of a mess, the boat was in an extremely convenient location at the end of the day. Aarhus: We aren&apos;t sure why we went to Aarhus, but the Danish queen was visiting that day, so we saw the royal yacht. The town is small and very walkable and on the Saturday we were there, there were many street markets and weddings. The Danish Resistance Museum was fascinating and definitely worth a stop if you are at all interested in WWII resistance movements. Most of the written information in the museum is in Danish (obviously), but about half or a little less is translated in English. Even still, the visuals are striking. Aarhus also has a ton of street art and if you have time, the little street called Møllestien is adorable. 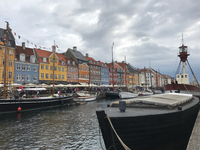 Copenhagen: The Little Mermaid statue is a fairly short walk from Langelinie pier and downtown Copenhagen is probably another 20 minutes from there. I&apos;d read that there is a bus that runs from that pier to Town Hall Square, but I never saw such a bus. We did the Grand Tour with Copenhagen Free Walking Tours and had a very nice walk and a hot dog snack (on our own, not with the tour). That about covers the tours--we didn&apos;t use the ship excursions for any port and used TJ Travel for all the organized tours we arranged. TJ was very easy to work with and offers excellent prices and discounts for combining tours. That said, if we did this cruise again, we would only use TJ for St. Petersburg and go it alone in all the other ports. All in all, this was a great, great cruise and we would definitely do it again! This cabin was the best. One deck below the Solarium and the Wind Jammer and just a couple decks above everything else. Very close to the elevator and literally steps away from the Centrum for the nightly festivities. Even though we were close to the Centrum, we had no noise issues due to a large door that was closed nightly at 9pm. The (nearly) floor to ceiling windows gave an excellent view. The only complaint we had was that the windows were pretty dirty. We aren&apos;t sure why we went to Aarhus, but the Danish queen was visiting that day, so we saw the royal yacht. The town is small and very walkable and on the Saturday we were there, there were many street markets and weddings. The Danish Resistance Museum was fascinating and definitely worth a stop if you are at all interested in WWII resistance movements. Most of the written information in the museum is in Danish (obviously), but about half or a little less is translated in English. Even still, the visuals are striking. Aarhus also has a ton of street art and if you have time, the little street called Møllestien is adorable. We spent two days in Amsterdam before the cruise. The FreeDAM Walking Tour gave us a good overview of the city and the iAmsterdam card included public transport and entrance to a bunch of museums. The Little Mermaid statue is a fairly short walk from Langelinie pier and downtown Copenhagen is probably another 20 minutes from there. I&apos;d read that there is a bus that runs from that pier to Town Hall Square, but I never saw such a bus. We did the Grand Tour with Copenhagen Free Walking Tours and had a very nice walk and a hot dog snack (on our own, not with the tour). We had a very short amount of time in Helsinki so we decided to use our St. Petersburg tour operator, TJ Travel, to schedule a Helsinki tour. The tour was ok. We&apos;d read prior that Helsinki didn&apos;t really have a lot to see and do for such a short stop and I&apos;d have to agree with that assessment. Most enjoyable was the small market at the Esplanade Park and the public art at the cathedral. Our tour guide also pointed out a spot where Finnish people go to clean their rugs and when we arrived at the Sibelius monument, she said, "I don&apos;t know what you were expecting, but this is what you get." This is now my new life motto, so thank you, lovely Helsinki! We booked a two-day tour with TJ Travel and would recommend TJ a million times ue to their great price (much less than the ship excursion) and small group size—ours was only 13 in a nice little van. We visited the Hermitage on a Monday while it was closed to the public and walked through empty rooms; we went in through the back door at Catherine&apos;s Palace and waited approximately two minutes for entry instead of three hours out front; and et cetera. The guide was super knowledgeable and literally walked us to the front of everything. 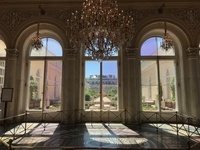 By the end of the second day I was tired of hearing about the amount of gold used to decorate the homes of imperial Russians, but that is not the fault of TJ, but rather my own trip planning failings. So, if imperial Russia is not your thing, the "standard" tour of almost all the tour operators will not be your thing. We opted for another local tour with TJ Travel in Stockholm so that we could get to the Vasa Museum and back around to Stockholm&apos;s other sights. The Vasa was...a museum! I mean, I guess I&apos;m glad we went there, but if we hadn&apos;t gone there, I can&apos;t imagine that I would have cared much at all. The story of the Vasa itself is fascinating, but I already knew the story before we got there because I’d read that everyone goes to Vasa and wondered "What the heck is a Vasa?" Walking through the old town was fun, we got another good, cheap lunch at a bakery and one of our favorite souvenirs at the second hand shop near the Nobel Museum. At the Nobel Museum cafe, all the chairs are signed by past Nobel Prize winners, so we had a bit of fun looking under the chairs and trying to find our favorite economists. This was also our only tender port, but our boat was parked literally feet from old town, so while the tendering process itself was a bit of a mess, the boat was in an extremely convenient location at the end of the day. Next to St. Petersburg, Tallinn was hands down our favorite port. The town is picturesque and the port is a very short walk from Old Town. 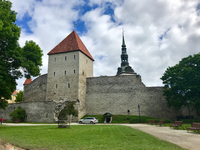 We did a free walking tour with Tallinn Free Tours and it was one of the best walking tours we&apos;ve had in any location, ever. 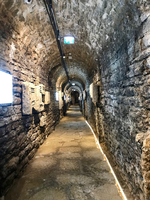 We had a nice, cheap lunch from a bakery and went into the tunnels at Kiek in the Kok before heading back to the ship. A++ town, 11 out of 10, would visit again.